Model phenomena that help astronomers locate and find the mass of black holes. They are part of the life cycle of stars. Some stars, like our sun, will fizzle out when the hydrogen, then helium, fuel is all used up. Others become giant supernovas as the core collapses, and then form either a neutron star or a black hole. 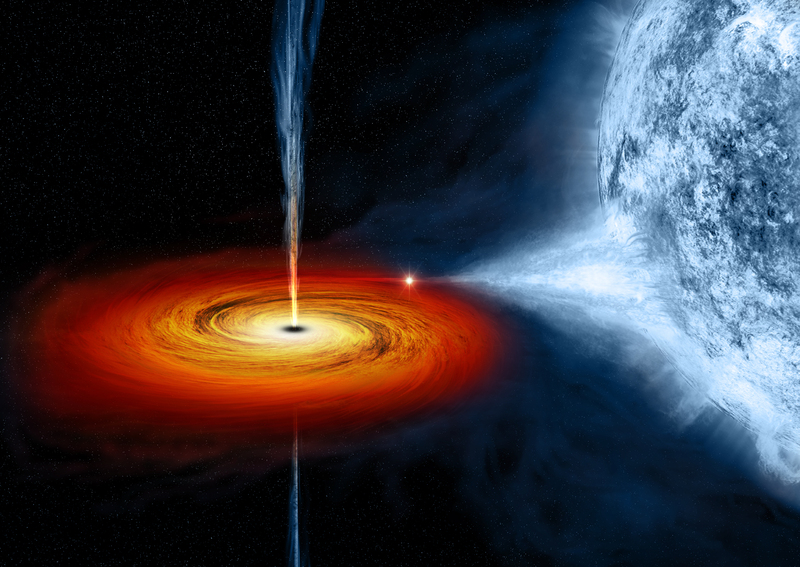 Black holes have so much gravity that even light cannot escape them. All matter has gravity. The more matter a body has, the more gravity it creates. You have more gravity than your pencil. The school building has more gravity than you. The earth has more gravity still, the sun more, and black holes the most. Black holes have so much gravity that even light cannot escape. Black holes have so much gravity, not because they are large, but they have a LOT of matter packed together. Black holes can, in theory, come in any size. The matter just has to be densely enough packed. Earth would be a black hole if it had a diameter of 2cm. Our sun is one of 100 billion stars in our Milky Way galaxy. The Milky Way also has 100 million black holes, including a super massive black hole at the centre, called Sagittarius A*. It is thought that black holes exist at the centre of every galaxy. So if we can’t see black holes, how do we know they exist? By how they affect the stars and dust clouds around them. Students move through four stations to explore different phenomena around black holes, that allows us to study them. They fill out the accompanying worksheet (attached below). 1. Orbits of stars around a black hole with the gravity well model. Set up the activity with the event horizon in the centre. Model stars orbiting a black hole, and experiment with orbit shapes and speeds. 2. Swirling gas around a black hole modelled with the tornado in a bottle activity. Long streamers of gas are pulled into the black hole, travelling faster as it gets closer to the black hole. As the matter accelerates into the black hole and heats up, it emits x-rays that radiate into space. We can detect these X-rays. This activity models the rotating accretion disc with gas being pulled into the black hole. 3. Orbit speed around the black hole activity. When astronomers find a star in orbit with an invisible companion, they can look at the size and speed of the orbit to figure out the size of the black hole. Students model two masses orbiting each other to observe relative orbit sizes and speeds. This activity models the appearance of light distorted by a black hole.